Visit Instant Cash Canada And Apply For A Loan Today! Are you a resident of Windsor and in need of urgent cash? There is no need to depend on someone else when you can easily get help by utilizing one of your assets. Visit Instant Cash Canada and get your problems sorted using your lien-free vehicle. We offer Car Title Loans in Windsor with loan amounts up to $40,000, which is dependent on the condition and value of your vehicle. Instant Cash Canada is one of the leading car title loan companies in Canada. Taking up an Auto Title Loans in Windsor is really very easy and convenient as our payments can be as low as $97 per month. When you apply for a car collateral loan with us, you get a complete package which includes the inspection of your vehicle (which is completely based on its value and condition) and repayment plans that suit all types of lifestyles and budgets. 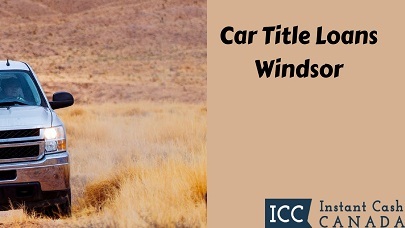 How Do You Qualify For Vehicle Title Loans Windsor? To get a loan with us, all you need is to own some documents like a valid Canadian driver’s license, a proof of permanent residency and a clear vehicle title. Where most other companies will only allow you to take a loan for no more than 60 days, we offer longer loan terms that can extend up to 4 years. If you have any doubt regarding car collateral loans Windsor, our loan representatives are available to assist you with the best financial advice. We promise to provide quickest and most convenient title loan services in Canada! For Further Details Regarding Our Title Loan Services In Windsor, Call Us (Toll-Free) 1-866-840-7395 and Apply Online Now!